After the most successful season in program history, UMBC Mock Trial ended the competitive year in Los Angeles, California, where the top 48 teams in the country gathered for the National Championship Tournament. UMBC Mock Trial earned its place in that field with a bid out of the Delaware Opening Round Championship Series, and ten members of UMBC’s A team traveled to LA to participate in this elite competition. Attorneys Dylan Elliott, Zuhair Riaz, Brandon James, Summer Akhtar, Kayla Smith, and Sambhav Dhawan, and witnesses Lily Felber, Alex Ezigbo, Kaitlyn Kauffman, and Jonathan Ruiz, along with head coach Ben Garmoe and assistant coach Travis Bell, spent four days in LA scrimmaging and competing with case materials that were released less than four weeks before the tournament. Before the tournament began, the team spent an entire day scrimmaging with Northern Illinois University, and also scrimmaged the University of Illinois before round 1. Once the tournament began, UMBC Mock Trial had spirited rounds against the University of Richmond and Pennsylvania State University, and earned ballot splits with American University and Rhodes College. In addition to earning the first Nationals ballots in program history, UMBC Mock Trial added its first ever all Americans, as Brandon James was named an All-American Attorney and Alex Ezigbo was named an All-American Witness. The team also was named the first runner-up for the Spirit of AMTA Award, which is given to the team who best exemplifies the values of collegiality and fair play. It was a very successful conclusion to a remarkable year. After returning from Los Angeles, the whole program came together to start a new tradition that will continue into the future: the end of season banquet and senior recognition. 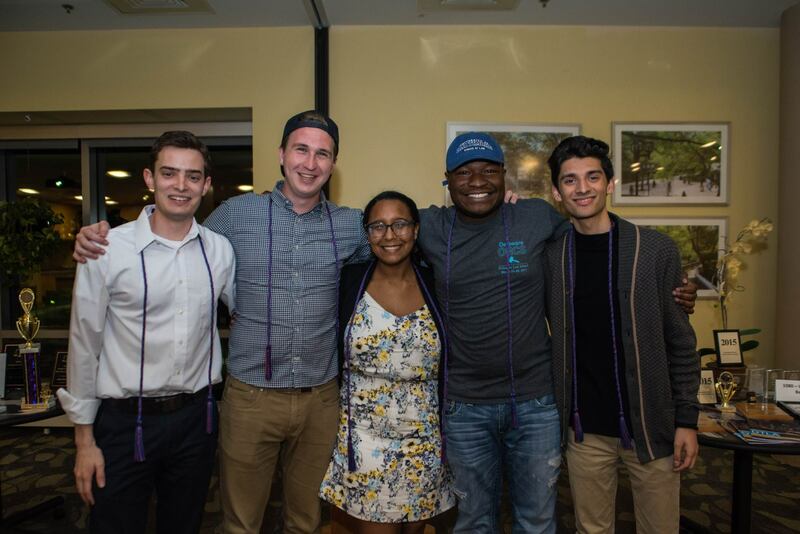 Seniors Dylan Elliott, Zuhair Riaz, Brandon James, Kayla Smith and Zachary Garmoe received their AMTA graduation cords in appreciation of their dedication and hard work over the past several seasons. These five graduating seniors were a part of the most successful years in UMBC Mock Trial history, winning a collective 23 individual awards over their time with the program. Dylan Elliott will be attending the University of Maryland School of Law in the fall, while Kayla Smith will head to Brooklyn Law School and Brandon James will attend the University of Baltimore School of Law. The program is now working to prepare for its seventh competitive season. Newly elected President Jaedon Huie, Vice-President Summer Akhtar, Secretary Kaitlyn Kauffman, Treasurer Alex Ezigbo, and Recruitment Chair Ethan Hudson are hard at work planning the 2017-18 competition schedule and auditions. The 2017-18 case packet will be released around August 15th, and UMBC Mock Trial will be ready to start all over again!